Here is a terrific new baby gift idea for boys and girls! We have paired some super soft plush animals with a matching snuggle blanket! Available with a baby pony, lamb, giraffe or tie dyed teddy bear design. Measuring a generous 28 by 40 inches, the blanket has a thick fuzzy side and a ribbed plush texture on the back making it an ideal belly blanket for the floor. 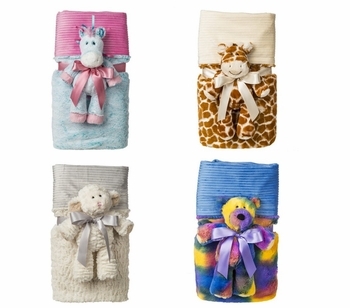 Baby can be wrapped in cozy comfort and enjoy playing with the plush toy covered with the same fabric. Each animal character stands 9 inches tall and features unique marshmallow-like soft filling making it very huggable and sure to become a favorite. Both the toy and blanket are machine washable for easy clean ups too! See More Images to see each set individually and be sure to specify your animal choice when ordering. Each set has a lovely presentation as shown; both items will come wrapped together with coordinated satin ribbon tied in a bow. Free shipping is also included.